Daimler said on Thursday (22 October) it had set new records for unit sales and revenue in the third quarter of 2015. Revenue rose 13% year on year to EUR37.3bn on sales (also up 13%) of 720,000 cars and commercial vehicles. Sales of 508,400 units set a new quarterly record at Mercedes-Benz Cars. Group EBIT slipped 2% to EUR3,661m in the third quarter but Q3 2014's result had been boosted by the sale of the stake in Rolls-Royce Power Systems, resulting in a gain of EUR1,006m. Group EBIT from ongoing business increased 31% to EUR3,657m. Net profit was down to to EUR2,415m from EUR2,821m a year ago and earnings per share were EUR2.23 versus EUR2.56. Mercedes-Benz Cars beat last year's result as unit sales rose. The other automotive divisions also increased earnings compared with a year ago. Daimler Financial Services also achieved higher Q3 earnings than last year, due to increased contract volume. "The implemented efficiency programmes and changes in exchange rates had an additional positive impact on operating profit," Daimler said. "We continue to grow profitably and are continually developing our business model. We are focusing on the steady expansion and renewal of the model range, innovative technologies and the utilisation of market potential," said finance head Bodo Uebber. "After three quarters of the year, we are well on the way to fulfilling our forecasts for 2015 and to completing this year as another extremely successful year." Third-quarter Mercedes-Benz Cars unit sales increased 18% to a record 508,400 vehicles. The main growth markets in Western Europe (+19%) were the United Kingdom (+25%), Italy (+28%) and Spain (+38%). In Germany, unit sales increased by 11%. The division also set new records for unit sales in the United States (5% growth) and in China (39%). Revenue rose 11% to EUR20.7bn and third-quarter EBIT of EUR2,183m was well above the prior-year figure of EUR1,584m. The return on sales was 10.5% and again above target (Q3 2014: 8.5%). Stuttgart, Germany – Daimler AG (ticker symbol DAI) continued with the successful implementation of its strategy and once again set new records for unit sales and revenue in the third quarter. With sales of 720,000 cars and commercial vehicles, the company sold 13% more vehicles between July and September than in the prior-year period. With sales of 508,400 units, Mercedes-Benz Cars had its strongest quarter to date. Group revenue of €37.3 billion in the third quarter was 13% higher than in the same period of last year. Adjusted for exchange-rate effects, revenue rose by 7%. Group EBIT amounted to €3,661 million in the third quarter (-2%). The prior-year period was positively affected in particular by the sale of the stake in Rolls-Royce Power Systems Holding GmbH (RRPSH), resulting in a gain of €1,006 million. But Group EBIT from the ongoing business increased significantly by 31% to €3,657 million. Net profit amounted to €2,415 million (Q3 2014: €2,821 million). Net profit attributable to the shareholders of Daimler AG amounted to €2,385 million (Q3 2014: €2,735 million). This led to earnings per share of €2.23 (Q3 2014: €2.56). Mercedes-Benz Cars in particular was able to significantly surpass its earnings of the third quarter of last year, as a result of further growth in unit sales. The other automotive divisions also increased their earnings significantly compared with the prior-year period. Daimler Financial Services achieved higher third-quarter earnings than last year, primarily due to its increased contract volume. The implemented efficiency programs and changes in exchange rates had an additional positive impact on operating profit. The special items affected EBIT in the third quarter of 2015 and 2014 as shown on page 11. The free cash flow of the industrial business in the first nine months of 2015 amounted to €4.8 billion (Q1-Q3 2014: €6.8 billion). The first nine months of 2014 included proceeds of €2.4 billion from the sale of the stake in RRPSH. In addition to increased investment in intangible assets, there was also an increase in working capital, defined as the net change in inventories, trade receivables and trade payables. A positive impact resulted from the higher profit contribution from the automotive divisions. Compared with December 31, 2014, the net liquidity of the industrial business increased from €17.0 billion to €19.5 billion. The increase mainly reflects the free cash flow of €4.8 billion. There was an opposing effect from the dividend payments to the shareholders of Daimler AG (€2.6 billion). The Daimler Group once again utilized attractive conditions in the international money and capital markets for refinancing in the first nine months of 2015. In that period, Daimler had a cash inflow of €13.9 billion from the issuance of bonds (Q1-Q3 2014: €10.1 billion), and bonds were redeemed in an amount of €8.5 billion (Q1-Q3 2014: €9.0 billion). At the end of the third quarter of 2015, Daimler had 286,248 employees worldwide (end of 2014: 279,972). Of that total, 172,561 were employed in Germany (end of 2014: 168,909) and 24,588 in the United States (end of 2014: 22,833). The consolidated companies in China had 3,027 employees at the end of September (end of 2014: 2,664). Third-quarter unit sales by Mercedes-Benz Cars increased by 18% to 508,400 vehicles. This made the past quarter the best so far in terms of unit sales. The main growth drivers in Western Europe (+19%) were the United Kingdom (+25%), Italy (+28%) and Spain (+38%). In Germany, unit sales increased by 11% in a highly competitive market. Mercedes-Benz Cars set new records for unit sales in the United States with growth of 5% and in China with an increase of 39%. Revenue rose by 11% to €20.7 billion. The division’s third-quarter EBIT of €2,183 million was well above the prior-year figure of €1,584 million. The return on sales was 10.5% and was thus once again above the target level (Q3 2014: 8.5%). The development of earnings primarily reflects the growth in unit sales in all regions. Strong contributions came from the new C-Class and the SUV segment. Efficiency programs and strong pricing also had a positive impact on EBIT. There were opposing effects on earnings from the regional sales structure. Daimler Trucks’ unit sales increased compared with the third quarter of last year by 2% to 128,500 vehicles. Sales developed very positively in the NAFTA region, Western Europe and Japan. The division achieved growth of 19% in the NAFTA region with sales of 52,200 trucks – a new record. In Western Europe, Daimler Trucks increased its unit sales by 12%, while a decrease of 37% was recorded in Latin America due to the significant market slump in Brazil. In this environment, Daimler Trucks was able to take over the market leadership in Brazil in the medium- and heavy-duty segment. Unit sales in Asia were 6% lower than in the prior-year quarter. Revenue rose significantly to €9.7 billion (+14%). The division’s EBIT of €791 million was also significantly higher than in the prior-year period and represents the best-ever quarterly earnings (Q3 2014: €588 million). The return on sales was 8.2% (Q3 2014: 6.9%), thus also surpassing the target level. The positive development of earnings was primarily driven by higher unit sales in the NAFTA region and Europe, positive exchange-rate effects and the realization of further efficiency improvements. Earnings were negatively affected by lower unit sales in Latin America and Indonesia, and EBIT was additionally reduced by expenses for capacity expansions and advance expenditure for new technologies and vehicles. Workforce actions in the context of the ongoing optimization programs in Brazil and Germany resulted in expenses of €10 million. Mercedes-Benz Vans increased its unit sales to 75,700 vehicles in the period under review, a new record for a third quarter (Q3 2014: 72,200). Unit sales in Western Europe increased by 2% to 48,100 vehicles. The division’s unit sales grew at double-digit rates in Spain, the Netherlands, Italy and Belgium. In Germany, unit sales were 6% lower than in the prior-year period. The main drivers of the 21% growth in unit sales in Eastern Europe were Russia (+22%) and Turkey (+15%). Mercedes-Benz Vans continued along its growth path also in the NAFTA region (+18%), while unit sales decreased by 3% in the difficult market environment in Latin America. Revenue of €2.8 billion was also significantly higher than in the prior-year period (Q3 2014: €2.5 billion). The division’s operating profit of €193 million significantly surpassed the prior-year earnings of €176 million. The return on sales of 7.0% was the same as in the third quarter of last year. Mercedes-Benz Vans’ third-quarter revenue and EBIT were influenced by the very good development of demand in Europe and the NAFTA region. In addition, improved pricing continued to have a positive impact on earnings. Daimler Buses sold 7,400 buses and bus chassis worldwide in the third quarter of 2015 (Q3 2014: 8,600). The significant decrease primarily reflects the weak business with bus chassis in Latin America (-26%). Growth primarily in Germany (+9%), the United Kingdom (+81%) and Turkey (+13%) due to increased demand for complete buses only partially offset the drop in unit sales of bus chassis in Brazil. As a result of falling unit sales in Latin America, Daimler Buses’ revenue of €1,018 million was slightly lower than in the prior-year period (Q3 2014: €1,034 million). However, the bus division’s EBIT of €89 million was significantly above the prior-year level (Q3 2014: €64 million), while its return on sales increased from 6.2% to 8.7%, once again surpassing the target level. The development of earnings was primarily driven by very positive exchange-rate effects. This was particularly a reflection of the weakness of the Brazilian real against the US dollar in connection with the export business from Brazil. That significantly overcompensated for the decrease in unit sales in Latin America – due to the difficult economic situation there. The restructuring of the Group’s own dealership network had an impact on the earnings of the automotive divisions. Daimler Financial Services concluded approximately 379,500 new leasing and sales-financing contracts in the third quarter (+12%), increasing its new business compared with the prior-year period by 18% to €14.6 billion. Contract volume reached €111 billion at September 30, 2015, representing growth of 12% compared with the end of 2014. Adjusted for exchange-rate effects, contract volume grew by 10%. The Daimler Financial Services division posted third-quarter EBIT of €378 million, thus surpassing its prior-year earnings (Q3 2014: €355 million). The strong earnings were primarily the result of increased contract volume and the favorable development of exchange rates. EBIT was reduced by additional expenses in connection with the expansion of business activities. The reconciliation of the divisions’ EBIT to Group EBIT comprises gains and/or losses at the corporate level and the effects on earnings of eliminating intra-group transactions between the divisions. Items at the corporate level resulted in income of €11 million (Q3 2014: €947 million). The higher income in the prior-year quarter mainly reflects the gain of €1,006 million realized on the sale of the RRPSH stake. The elimination of intra-group transactions resulted in income of €16 million in the third quarter of 2015 (Q3 2014: €18 million). The Daimler Group invested €1.1 billion in property, plant and equipment in the third quarter (Q3 2014: €1.2 billion). Most of that investment volume, €0.8 billion, was at the Mercedes-Benz Cars division (Q3 2014: €0.9 billion). The main area of capital expenditure was on production preparations for new models, in particular the new E-Class and its derivatives, the additional derivatives of the C-Class, and investments for new transmissions and engine versions. Another area of capital expenditure was for the ongoing expansion of the international production and component plants. The Daimler Group’s research and development spending in the third quarter of this year amounted to €1.6 billion (Q3 2014: €1.4 billion), of which €0.5 billion was capitalized (Q3 2014: €0.3 billion). More than two thirds of the research and development spending was at the Mercedes-Benz Cars segment. The main areas were new vehicle models, particularly fuel-efficient and environmentally friendly drive systems, and new safety technologies. At the beginning of the fourth quarter, the prospects for the world economy are rather restrained. Although major leading economic indicators suggest that the moderate growth will continue, they also reveal a significant increase in uncertainty on the part of investors and consumers. This means that no significant acceleration of global growth can be expected in the foreseeable future. Overall, Daimler anticipates moderate growth in output of about 2.7% for the world economy in the year 2015, in the magnitude of the past three years. With regard to worldwide demand for cars, the market volume in full-year 2015 is likely to be in the magnitude of the previous year. The main reason for the further reduction in Daimler’s expectation is the recent weakening of market growth in China, where only a slight increase in demand is now anticipated. This year, positive contributions to the development of the world market will mainly come from the traditional markets of North America and Western Europe. The US market should expand slightly again from its already high level and approach its historic high with sales of approximately 17 million cars and light trucks. The recovery of demand for cars in Western Europe has gained further dynamism this year, so Daimler meanwhile anticipates significant market growth on a broad base. On the other hand, the pronounced decline of the Japanese market is having a negative impact on the world market; following several years of artificially high demand, Daimler now expects a significant correction of the market volume there. An additional negative impact on the world market comes from sharply falling demand in some large emerging markets. Car sales in Russia and Brazil in particular will decrease drastically due to the significant economic recessions in both countries. The situation is more encouraging in India, where a demand revival continues to be assumed. In the worldwide market for medium- and heavy-duty trucks, another pronounced drop in demand is expected in 2015 following last year’s significant decrease. Furthermore, the situation will remain highly varied from one region to another. Market prospects for the NAFTA region and Europe continue to be positive. In North America, the main economic indicators continue to suggest that demand for trucks will remain favorable, supporting expectations of growth in demand in the magnitude of 10 to 15%. Thanks to the relatively solid economic recovery in Europe, Daimler anticipates market growth of 10 to 15% there as well. However, market conditions in Brazil are still extremely unfavorable. Starting from a low level, another sharp decline of up to 50% must be expected. The Japanese market for light-, medium- and heavy-duty trucks appears to be relatively robust despite the country’s sluggish economy, so a market volume in 2015 in the magnitude of the previous year is anticipated. But following a very weak development this year to date in Indonesia, it must meanwhile be assumed that the overall truck market there will be up to 35% smaller than in 2014. The deep recession in Russia will continue to affect the market, so demand will fall sharply once again. But a significant market recovery is anticipated in India, thanks to the slightly improved economic prospects there. Demand for trucks in China is currently under great pressure due to the economic slowdown and the introduction of the CN4 emissions standards (similar to Euro IV). Daimler therefore expects the market to contract by about 30% compared with its prior-year level. Daimler assumes that the market in Europe for medium-sized and large vans will grow significantly in 2015, and slight growth is expected in the market for small vans. For the United States, significant growth is expected in the market for large vans. Daimler now anticipates significant contraction of the market it addresses in China. Also in Latin America, Daimler expects significant contraction in the market for large vans. The market volume for buses in Europe should be slightly above the very low level of 2014. In Brazil, demand for buses is likely to decrease by at least 35% in 2015 compared with last year. On the basis of the divisions’ planning, Daimler expects its total unit sales to increase significantly in the year 2015. The past three months were the strongest quarter for Mercedes-Benz Cars so far. The division intends to continue along this successful path in the fourth quarter, and thus to significantly increase its unit sales in the full year. Among other models, the new C-Class Coupé will contribute to the success of the Mercedes-Benz brand. The third member of the C-Class family will be in the showrooms this December. The year of Mercedes-Benz SUVs will be rounded off in November with the world premiere of the new generation of the GLS. The S-Class family will also be expanded: The new S-Class Cabriolet is the sixth version of the current S-Class family and can be ordered as of the end of this year. In November, another Mercedes-Benz icon will have its world premiere: the new generation of the SL roadster. The two smart models will be available in all major markets this year and will also contribute to the significant increase in unit sales. Daimler Trucks now anticipates a slight increase in unit sales in full-year 2015. In Western Europe, the division continues to expect a significantly positive development of truck sales. In Turkey, a significant increase is expected compared with 2014, but growth dynamism has decreased sharply in the course of the year due to the weak economic development and the uncertain political situation in the region. In Brazil, the truck division anticipates a substantial decrease in unit sales, as the overall economic situation and unfavorable financing conditions are severely dampening demand for trucks. In the NAFTA region, however, Daimler Trucks assumes that its unit sales will increase significantly. The successful products should continue to secure the division’s market leadership in that region. Unit sales in Asia are affected by the very weak market development in Indonesia, where a substantial decrease in unit sales is meanwhile anticipated. On the other hand, it is assumed that unit sales in India will increase significantly due to the steady growth of the BharatBenz model range and the further expansion of the dealer network. Daimler Trucks expects a noticeable increase in truck deliveries also in Japan this year. Mercedes-Benz Vans plans to achieve significant growth in unit sales in 2015. In Europe, its core market, the division anticipates significant increases in sales of medium-sized and large vans. This development is likely to be primarily driven by the new Vito for commercial use and the V-Class multipurpose vehicle for private use. Both those models are now fully available following their launch in 2014. A significant increase in unit sales is anticipated also in the NAFTA region. In the context of the “Mercedes-Benz Vans goes global” strategy for the division, the Vito is being launched in North and South America, stimulating additional demand there. The aim is to achieve further growth in those markets also with the Sprinter, which will be produced also in North America in the future. Daimler Buses assumes that it will be able to defend its market leadership in its core markets for buses above 8 tons. For the year 2015, the division anticipates a significant decrease in total unit sales for market-related reasons. Unit sales are expected to fall significantly in Latin America, while a positive development is anticipated in Europe. Daimler Financial Services anticipates significant growth in new business and contract volume in the year 2015. This will result from the growth offensives of the automotive divisions, the specific targeting of younger customers, the expansion of business especially in Asia, and the further development of online sales channels. The range of mobility services will also be systematically expanded. Daimler assumes that Group revenue will grow significantly in the year 2015. In regional terms, the strongest increases are anticipated in Asia and North America, but significant growth is expected also in Europe. On the basis of the anticipated market development and the planning of the divisions, Daimler assumes that EBIT from the ongoing business will increase significantly in the year 2015. The anticipated development of earnings in the automotive divisions will have a positive impact on the free cash flow of the industrial business in 2015. Although the product and growth offensive will be continued with higher expenditure for property, plant and equipment as well as research and development, it is now assumed that the free cash flow of the industrial business will be slightly higher than in 2014 and thus significantly higher than the dividend payment in 2015. In order to achieve the ambitious growth targets, the already very high investment in property, plant and equipment will once again be slightly increased in the year 2015 (2014: €4.8 billion). 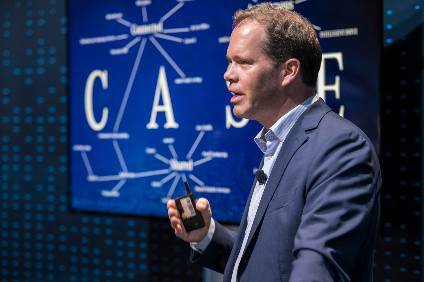 In addition to capital expenditure, Daimler is developing its position in the emerging markets by means of targeted financial investments in joint ventures and equity interests. With its research and development expenditure, Daimler anticipates a total volume significantly above the previous year’s spending of €5.7 billion. Key projects include the successor models of the E-Class and the compact class as well as the GL and GLE SUVs. In addition, Daimler is investing in all automotive divisions in new, low-emission and fuel-efficient engines, alternative drive systems, innovative safety technologies, autonomous driving and digital connectivity. From today’s perspective, Daimler assumes that the number of employees worldwide will increase slightly compared with the end of 2014. In early August, Daimler AG, AUDI AG and the BMW Group agreed with Nokia Corporation to acquire its digital mapping business, HERE. This step is intended to secure for the long term the availability of the products and services of HERE as an open, independent and value-adding platform for cloud-based maps and mobility services. The digital maps of HERE lay the foundation for the next generation of mobility and location-based services, which in turn form the basis for new assistance systems going as far as fully automated driving. Extremely precise digital maps are combined with real-time vehicle data in order to increase road safety and facilitate innovative products and services. The three partners are acquiring equal shares in HERE. 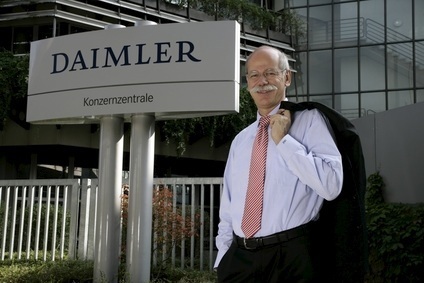 Daimler’s share of the purchase price will amount to approximately €0.85 billion. Subject to the approval of the responsible antitrust authorities, the transaction is expected to be concluded by the end of the first quarter of 2016. Daimler Trucks has received special approval to test a series-produced heavy-duty truck with the Highway Pilot system on German highways. The Highway Pilot in the series-produced Actros connects the latest assistance systems and allows the truck to be driven in partial autonomous mode. The approval is an important step on the way to putting the system into series application. In this way, Daimler is consistently strengthening its pioneering role in the field of autonomous driving.